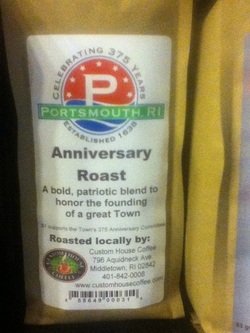 Custom House Coffee (600 Clock Tower Square, Portsmouth) has come up with a special blend of coffee to commemorate the Portsmouth 375th celebration. The blend, called "Anniversary Roast" is described as "A bold, patritic blend to honor the founding of a great Town" and is available in beans and ground version at the coffee shop. George Doumany, Co-owner of Custom House Coffee, Portsmouth (left) with Doug Smith ( 375th Committee Chair) display the first bag of "Anniversary Roast"